What a great start we have had for the RSC this year! 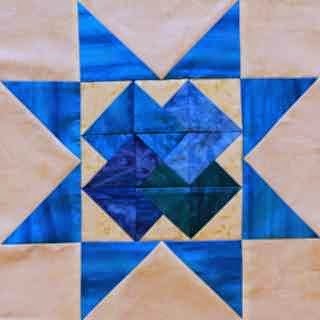 I am so excited to see all the great projects each week and it is keeping me motivated to turn my own scraps into quilts, one block at a time. I didn't put up all the crumb blocks or the orange peels now that I think about it, but I did pull out all the other blue I've been working on this month. Starting with the upper left and working clockwise: leftover nine patches from Mai Tai Sunrise last year, new nine patches for the framed nine patch this year, two Sawtooth Sampler blocks, one alternate block, one New York Beauty block, four postage stamp stars and finally, one white star on a blue background. For those working on the Sampler this year, there have been two blocks, the Whirling Geese and the Card Trick. I have also posted background fabric requirements, alternate block directions and how many blue blocks will be needed to make the alternate blocks in blue. All the links are located on the RSC15 Sampler tab at the top of the page in case you missed any posts along the way. If you didn't see the last post about the February giveaway of hand dyed fabric by Vicki Welsh, please scroll down or follow the link to enter for your chance to win. We were up to 75 comments last night! I am excited to get ready for another great month of sewing with scraps. How are your blues wrapping up? The new color for February will be pink. Technically this Saturday is still part of January, but I'm posting now for those of you who would like to get started on a new color. Along with a new color comes a brand new fabric giveaway! 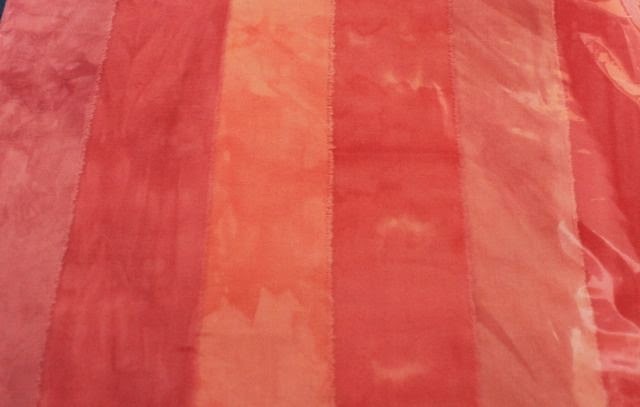 This is the pink pack of hand dyed fabric from the Rainbow Scrap Challenge Snack Pack. 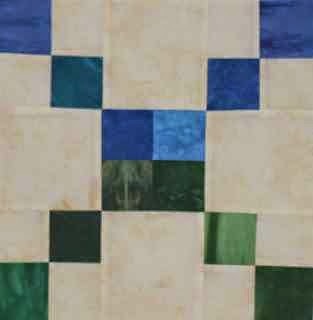 Vicki Welsh dyed it for our challenge, and I will be using mine for the sampler blocks this month. If you would like to be entered to win, just leave a comment on on this post with your favorite shade of pink. I've always liked ashes-of-roses since I read The Thorn Birds in junior high. 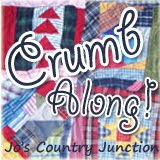 I pulled out the crumb jar today and just played. It was glorious! As busy as it has been lately, having a bit of mindless sewing was just what I needed. I squared up the bits that were big enough to 6.5 inches, and the ones that weren't are all 4.5 inches or diamonds now. Maybe next year I'll try tumbler blocks? There were a few more postage stamp stars sitting by the machine, so I worked them in as well. Kurt made it back safely from India. With very careful planning, he managed not to get sick, but even so, he came home tired and hungry! 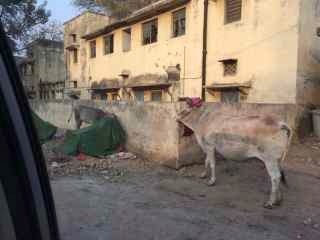 He said there were cows everywhere, wandering the streets and blocking traffic. It is wonderful to have him back again, not just because he mowed the yard today either. He has another quick trip tomorrow, but hopefully after that he can stay home for a bit. We've been having marathon sessions of Monopoly and Trivial Pursuit. 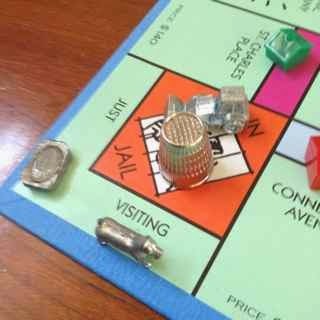 I had to sneak out to work yesterday morning and Anna sent this photo of everyone in jail. Such a bunch of criminals! It is 9 here and everyone else is already off to sleep. I don't think I'm long behind, but I'll enjoy the rest of Downton Abbey first with a bit on applique to keep my hands busy. I've had several questions about requirements for background fabric. You are welcome to use a variety of background fabrics, but for those who would like to use one fabric throughout, I've done the math for you. 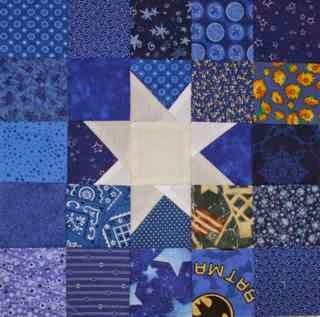 There are 25 star blocks, and for the background on those you will 2 yards of fabric. There are 24 alternate blocks and they need 4 yards. So if you are planning on one background fabric, 6 yards will be necessary. 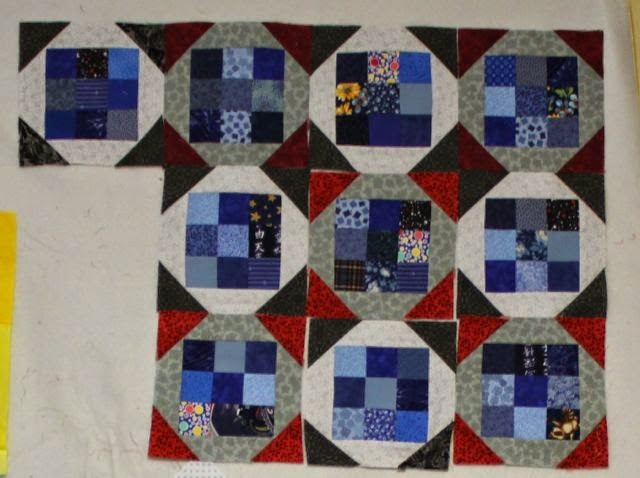 This does not include the background for the center of the stars, as these are sampler blocks, that have not been announced yet, there is absolutely no way to know how much is needed for those. So I would definitely suggest scrappy for those. Definitely. Now on to backing fabric. This will also need 6 yards. The finished quilt will about 90 x 90 depending on what you decide for borders. Please let me know if you have any other questions. I'm sorry to have left you all hanging for so long, the last couple of weeks have been lots of fun for me, but without lots of time for sewing. Thankfully, and three day weekend should help all that and give me a chance to get a little bit done. Unfortunately, we aren't quite ready to make alternate blocks yet. Most of them have at least two colors in them. They were designed to help transition between the star blocks, and so having multiple colors is quite important. We can however, get the cutting done ahead of time and sew together some of the subunits. 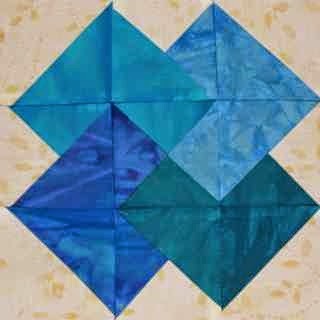 So, to mark the end of medium blue in the sampler quilt, start by cutting your extra blue scraps into 24 squares that are each 2.5 inches. 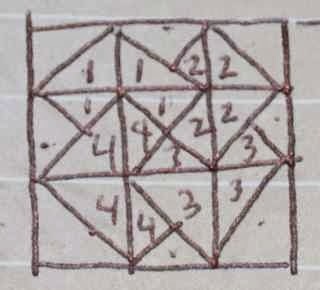 You may use 16 of these squares together with 16 background squares to make 8 four patches. 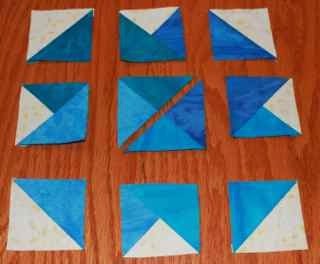 You may use 6 squares to make 3 two patches of blue and blue. The last two squares can just hang out alone for now. Anything that is left can go back into the scrap bin or get used for something else. Blue will come back again later this year, so if any of your scraps seem "light" or "dark" you might want to move them to those piles for later. Coming up next? Background fabric requirements. I'll be adding links to all of the directions to the RSC15 Sampler tab at the top of the page, so feel free to use it as a handy reference guide. 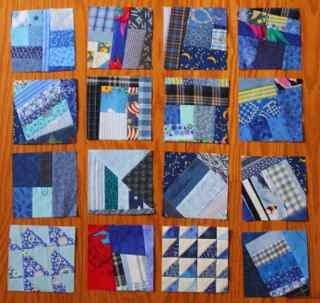 The alternate blocks for the sampler quilt are simple nine patches made with four patches and background squares. The subunits will be collected throughout the year, and as all the colors for each block come up, I'll post directions for how many of each color combination you will need to make. The colored squares are all 2.5 inches, and I'll let you know how many of each color you will need to save each month. 12 - 2.5 inch squares of colored fabric. 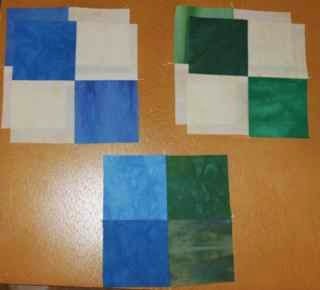 Take 4 squares of each color and combine them with a background square to make 4 two patches. 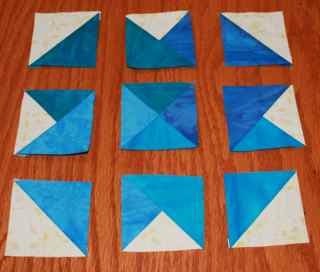 Take the remaining 2 squares of each color and sew them to make 2 more two patches. Combine the two patches together to make four patches. Two each of two colors with background and one with just colored blocks. 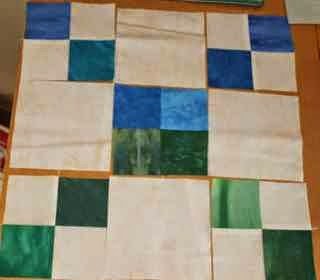 The four patches will be combined with the large background squares to make nine patches. 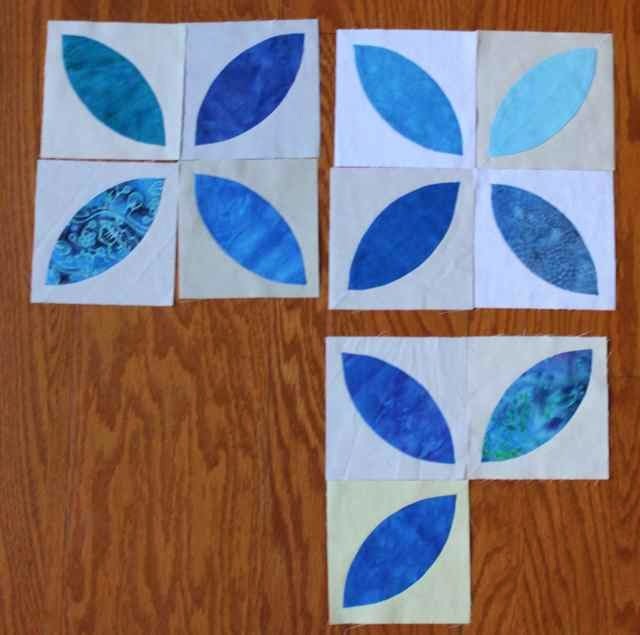 Four patches with background fabric will form the corners and the dark square will be in the center. This is your finished nine patch. It should measure 12.5 inches unfinished and will finish at 12 inches in the final quilt. 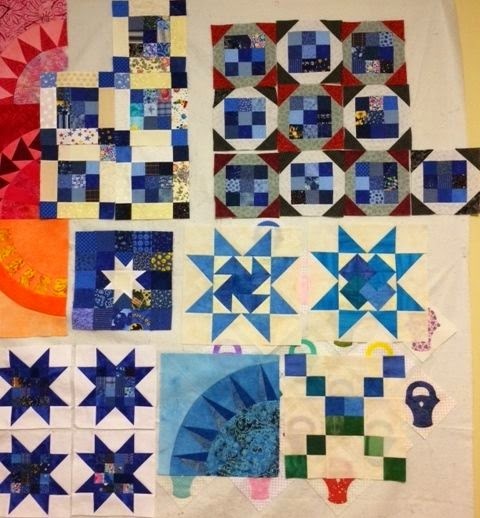 24 blocks are needed for the quilt, and we will be putting them together throughout the year as the appropriate colors are revealed. 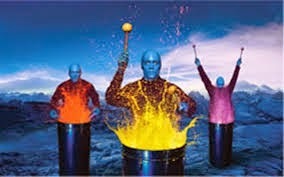 I'm not sure why I was thinking of it, but Kurt and I went to see Blue Man Group on my birthday a few years ago. I'll be in Orlando today, not to see Blue Man Group, but to see my students compete at Science Olympiad. So not a lot has happened on the sewing front this week, but I'm taking some hand work tomorrow to keep me busy while the kids are all scattered at their events. It is a three day weekend though, so I'll take full advantage of the extra day to catch up a bit. I hope your blue blocks are coming along nicely. 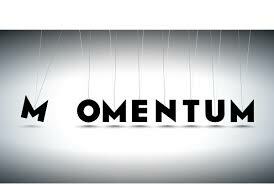 I'll be checking in between events to see all the wonderful projects that are being created by all of you. 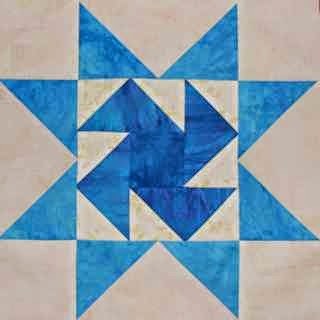 The alternate blocks for the star quilt are easy peasy. It would be easy enough to do them all at the end, but I am going to try to work them in slowly throughout the year for those who aren't big on procrastination. Unfortunately, the blocks contain more than one color, so they can't get finished until both of the adjacent colors have come up. I will post the number of squares to save each month though, and give partial assembly directions. Then, as soon as ALL the colors in the block have been announced, we can finish up the alternate blocks along the way. 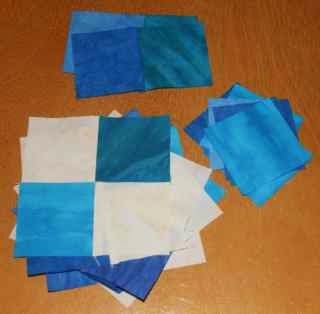 So step 1 is to save 25 blue squares from this month. They should be 2.5 inches each. I'm off to make a quick tutorial for the alternate blocks and do a bit of math for the background fabric usage. It's been on my MUST DO list all week, but things have been a bit frantic lately, fabric fun is next on the list though, so I'll be back soon with photos and instructions. 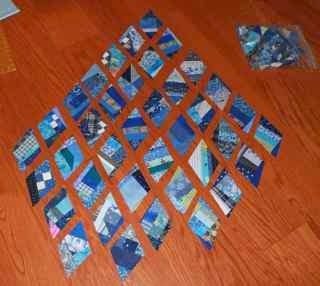 I had SO many blue scraps that I started out by sorting them into three piles. Baby blue, regular blue, and indigo blues. Then I stuck the light and dark piles back into bags to think about later and nicely ironed the regular blues. I trimmed what I could into 1.5, 2 and 2.5 inch strips and squares and then tossed the rest into crumbs or strings. So many fun blocks are hiding in these piles. Can't wait to start playing. I've seen lots of beautiful blue blocks coming out so far. It is one of those colors that tries to take over the stash and the scrap basket. I hope everyone is making a dent and taming the piles. 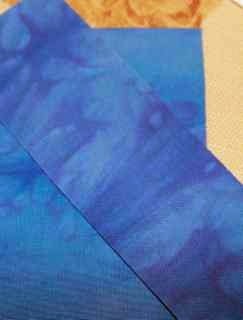 Just in case you need some more blue fabric to play with, I've done the random drawing for January's hand dyed blue fabric from Vicki Welsh. There were 102 comments on the color announcement post! A brand new record for sure. Thanks to the kind folks at Random.org, Pamela Arbour is the lucky winner this month. She is new to the challenge, which is great. Welcome! Pamela, please e-mail me directly with your snail mail, and I will ship off your envelope. I'll be sewing tomorrow, today I'm at school with this basket of toys so the kids can prepare for science olympiad next weekend. So many fun things they could build. Use misterlinky below to keep us all up to date on your progress. I've always wanted to try this block, I think it just looks cool, but I was always intimidated by the layout. Turns out it is just half square and quarter square triangle units. The key is in how they are arranged. It can be made with two fabrics or four, I chose four. You can do either. Just like flying geese, there are lots of ways to make these basic units. 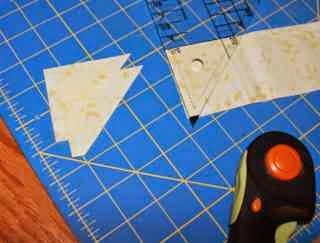 There is a nice tutorial here in case you are more comfortable cutting squares in half than using specialty rulers. I'll use the rulers though, because it is what I'm used to. So I started by making a little sketch of the block. 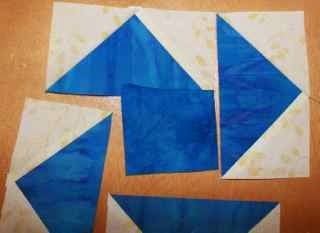 Each fabric needs 2 half square triangles and 2 quarter square triangles. In addition there are 4 half square background triangles and 4 quarter square background triangles. Start by cutting 1.5 and 2.5 inch strips of each fabric. For me this was 4 blues and the background. You might be using 2 blues and background instead. That is fine, one strip of each is plenty. 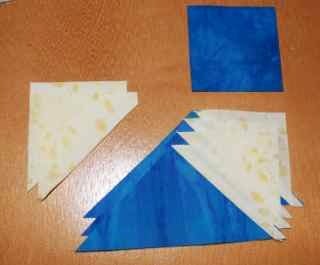 Use the companion angle ruler with the 1.5 inch strips to cut 2 quarter square triangles of each blue fabric. Cut 4 triangles of the background. 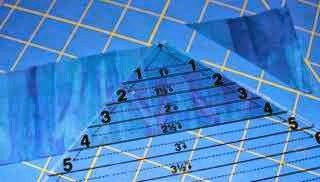 Use the easy angle ruler with the 2.5 inch strips to cut the half square triangle units. 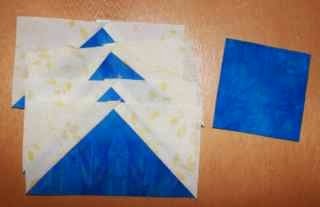 Cut 2 triangles of each blue and 4 triangles of the background fabric. So here are your subunits. 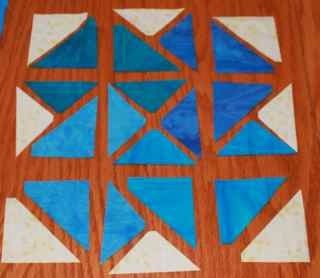 Two quarter square and two half square triangles of each blue and four of both units out of background fabric. Following the little sketch, lay out your subunits. Half square triangles make up each corner, while the sides are made of two quarter square triangles and one half square triangle. The very center is made of 4 quarter square triangles. Color placement is really important, so double check everything before you start sewing. First sew the four corners. Next sew the quarter square triangles along the short side. Press these carefully as the hypotenuse is along the bias. Bring the subunits back to your layout and put them back in place to make sure everything is sewn correctly. 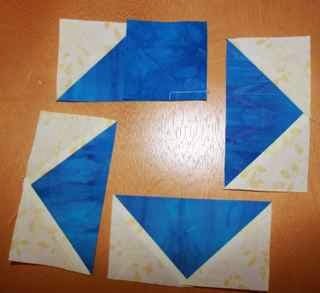 Now that the quarter square units are sewn together, they should be exactly the same size as the half square triangles. 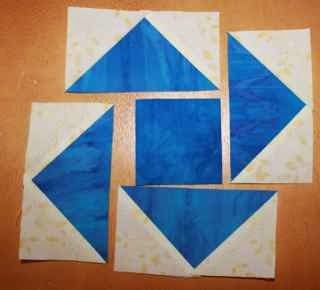 Sew these together and press toward the half square triangles. Now you can start working on the center section. 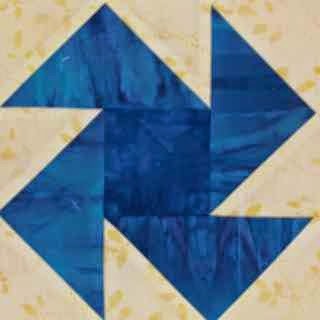 Sew the quarter square triangles together on the short side and then sew the pieced subunits together along the long side to make a square. Twirl the seams and press carefully. OK, now that you have pieced all those triangles, you have just a regular old nine patch to sew together. Check the color placement again just to be sure. Here is your finished Card Trick block. It should be 6.5 inches unfinished. Add the sawtooth star points to finish up the block. There is a tutorial here about how to put the star points together. I've had several questions about background fabric. I will do the math to figure out the yardage requirements. 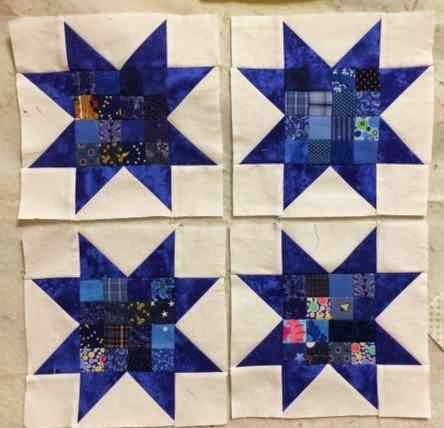 I've been using different fabrics so far for the center blocks, but I am planning a consistent fabric for both the star point backgrounds and for the alternate blocks. Come back next week for a tutorial on how to make the alternate blocks. I am officially in manic overdrive. Overbooked is so far behind me that I can't even remember what it looked like. Though we have only been back at school for two days since the break, it feels like a lot longer. Everything that is going on is GOOD. There is just so much of it that I can't get it all into a day! So tonight was Lego practice, and it involved sewing :) We have an egg theme going on this year, and so we made egg berets and egg shirts. If there is time before the tournament, there will also be egg pennants for the cheering section. We figured out a while ago that the Lego qualifying tournament and the Science Olympiad qualifying tournament were both on the same day. No problem though, Kurt would do one and I would do the other. 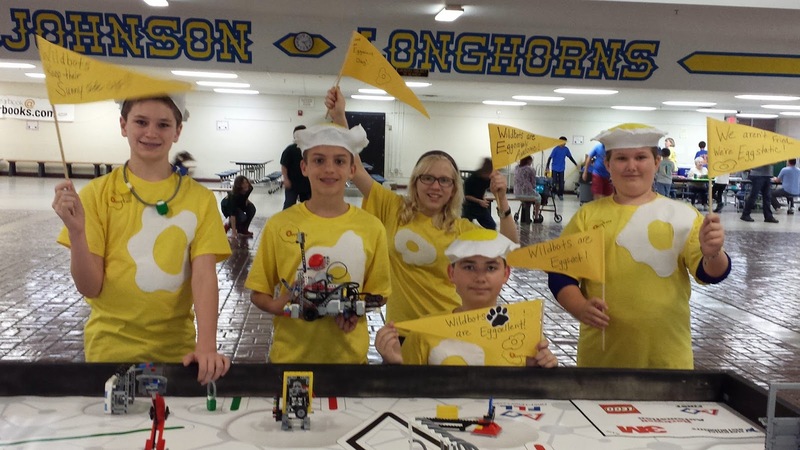 We both coach the Lego team, he does the robot part and I do the problem and team building part. Ryan is on that team. I am the only coach of the Science Olympiad team, and Anna is on that one. Divide and conquer and all will be well. All was well until Kurt scheduled a business trip to India on the same day. India! So another mom from the team will fill in for him and I will still go to mine. No problem right? Last night we were talking at dinner when we realized that his trip to India also happens during my annual AP Biology field trip. The overnight one to the University of Florida! So I'm taking 18 students out of town for a day and half while Kurt is literally half way around the world. YIKES! A lovely coworker who is apparently also and angel has offered to come and stay with the kids overnight while I am gone. Deep sigh of relief. I think all the balls are in the air at the moment, just hoping none of them drop. 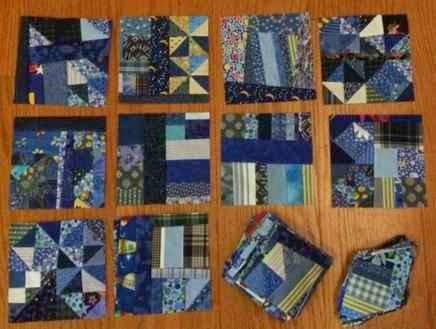 School starts again tomorrow and so I must go and catch up on e-mail and lesson plans, but I did take a bit of time first to play with some more blue scraps. I always have more blue than anything else, which is why it is a nice place to start. These are some 1.5 inch postage stamp squares leftover from the giant postage stamps of last year. With flying geese made from 2.5 inch strips, the 4 by 4 mini blocks make nice little stars. I think I'll keep the star points mostly solidish on this one. There is also the postage stamp chevron which still needs three more blocks. So I'd better dig out the orange and the light blue to get the blocks done for this one. I think a simple white lattice with grey cornerstones will finish this one off. 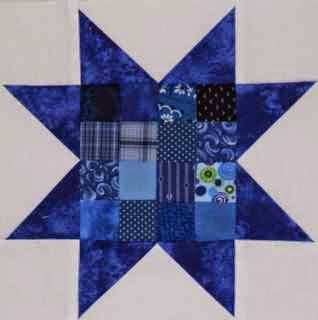 I've been pondering what to do with 2.5 inch squares, and was thinking of these white stars on a colored background. I've seen lots of them out there, and I love the look. The white stars can be in the center or any of the four corners and move around from block to block. After that it was a bit of a clean-up with leftover bits sewn together to make crumb blocks in a random assortment. These are squared up to 4.5 inches using the GO cutter. They would make nice centers to more stars, but I think I'll just save them up for now. We are finally home again after our 7 day cruise! There was quite a bit of time for slow stitching on the drive to the cruise port in Miami and while hanging out on the deck listening to an audio book and waiting for the kids to check in between activities. Having everything prepped made it all very easy to stitch at a leisurely pace. So these are my blue blocks so far. I think I'll group them into 4s, I'll still need to trim them down a bit before sewing them together, but they look pretty happy so far. I don't feel the need to make any grand sashing decisions yet, this one will go on all year. Head over to Kathy's Quilts to see what other slow stitching is going on during this day of rest. So I can't leave without a few pictures from the cruise. 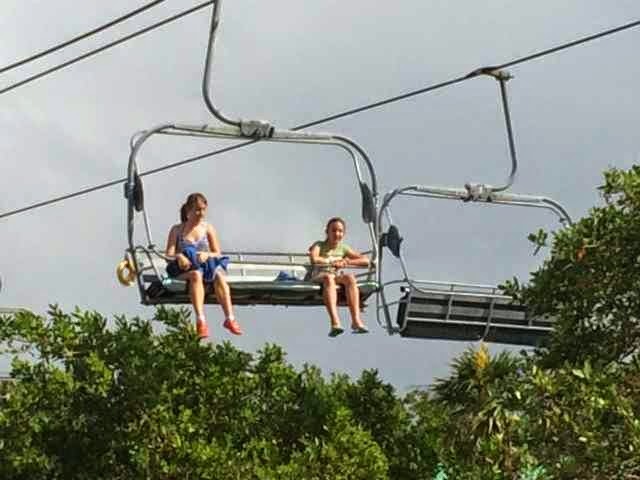 Here are the girls taking a chair lift to the beach at Mahogany Bay on Isla Roatan, off of the coast of Honduras. It was only a 5 minute walk, but they liked the lift anyway. 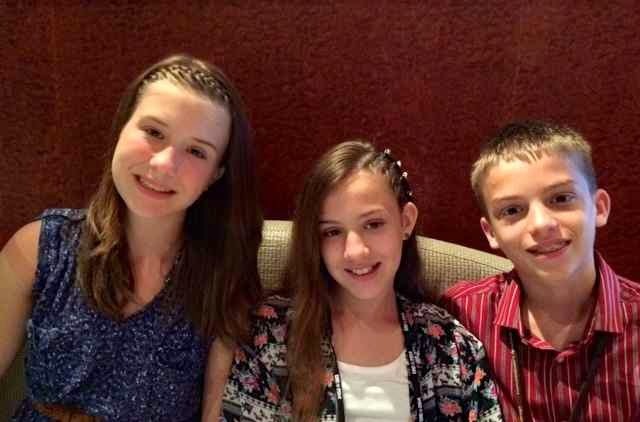 They got their hair braided, which I guess is part of the plan on a Caribbean cruise. Ryan skipped that part of the fun. They chose to snorkel with the stingrays in Grand Cayman. 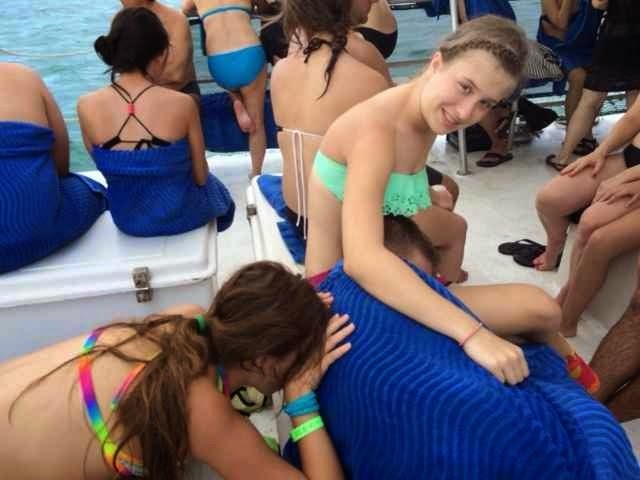 They were so tired on the boat trip back that everyone fell asleep except Anna. We also visited Belize and Cozumel. We did snorkeling at Chakanaab in Cozumel and went cave tubing in Belize. Thankfully there were also two days at sea for everyone to recover. Staying up late for the comedians and the evening shows put us all off of our normal early to rise routine. It feels great to be home again despite all the fun of vacation. Laundry is underway, everything else can wait a while. Tuesday is back to school for everyone. I have 289 e-mails to sort through, so please forgive me if I haven't responded back to your comments yet. I'll try to get through them today at some point. After finishing off the Mai Tai Sunrise quilt last year, I still had plenty of nine patches leftover. So this year I will be framing them out and adding snowball corners. If I make 10 each month there will be enough for a nice sized quilt at the end of the year. Here are the blue blocks. 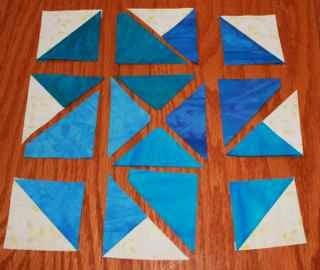 Each of the blue squares is 2 inches, which makes the nine patches 5 inches. The light and dark grey framing strips are 1.5 by 5 and 1.5 by 7. The snowball corners are 2.5 inches, I used the "flip and sew" method. I was inspired by a baby quilt that Bonnie Hunter showed recently. It is always fun to find new ways to put leader and ender blocks to good use. I hope your 2015 is off to a great start. 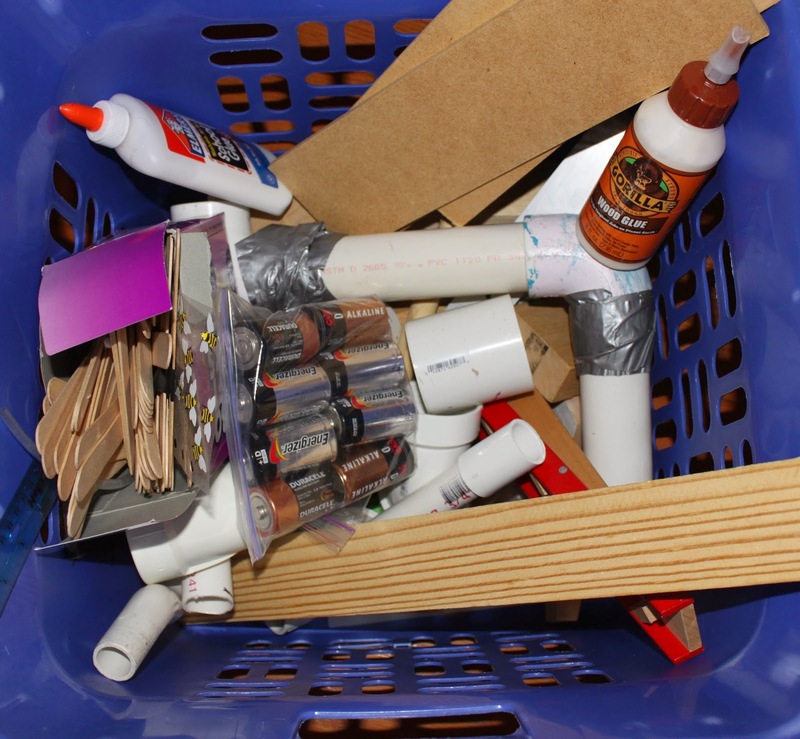 Use the linky below to share your blue scrap projects so far. 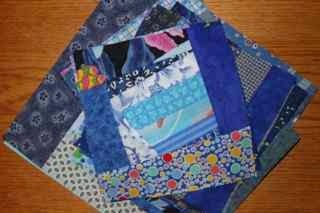 I'll be back into town shortly and will be choosing a winner for the blue pack of fabric by Vicki Welsh. Don't forget to enter the drawing, just scroll back to the color announcement post and leave a comment with your favorite word for blue. Vicki has already sold out of of Rainbow Scrap Challenge snack packs and I don't know if she will be making more, so this might be your only chance to have this collection of blue. The first sampler block this year will be a whirling goose block. There are a lot of different ways to make flying geese, but I'll show you the companion angle and easy angle ruler method. Here is a link to the traditional method that makes 4 at at time. Here is link to a youtube video for the same method. Here is a link to the more traditional sew and flip corner technique. 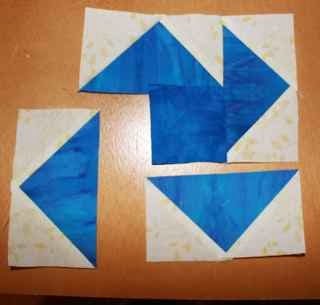 We'll need 4 flying geese for our block, each one should be 2.5 by 4.5 unfinished (2 by 4 finished). 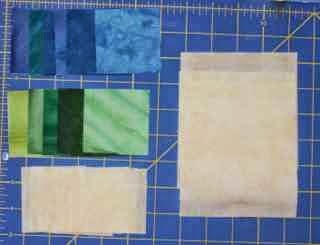 Start with 2.5 inch strips of background fabric and blue fabric. Use the easy angle ruler to make 8 small triangles. 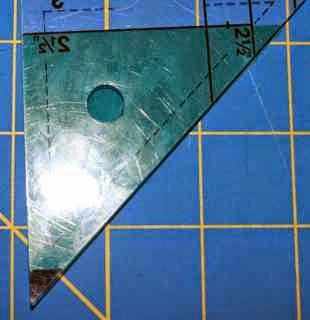 Next, use the companion angle ruler to cut 4 large triangles. 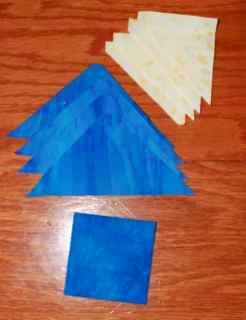 You will also need one 2.5 inch blue square, it can be the same blue or a different blue. Attach a wing to one side of each large triangle. Press the seams away from the blue. 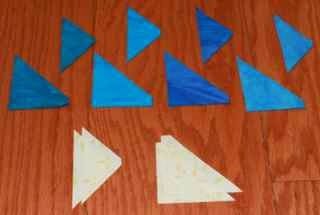 Sew another small triangle to the other side of each large triangle. Now you have your 4 geese and are ready for assembly. Arrange the geese around the center square as shown. 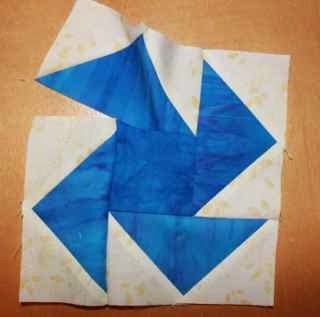 This block uses a partial seam method to sew the geese units together. You might have tried it already if you participated in last year's RSC, if not, no need to worry, it isn't as hard as it might seem at first. 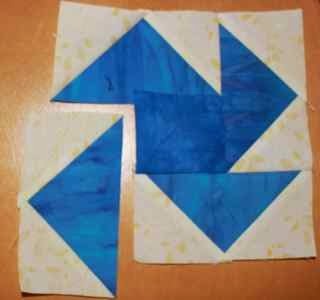 Start by placing the center square right sides together at the right side of the top goose block. Instead of sewing all the way across, start in the center and sew to the end. This will leave the left half of the square free and avoid having to do an inset seam at the end. Fold the square open and finger press the seam toward the square. Sew the second goose onto the right side of your joined unit. Finger press again and attach goose number 3 to the bottom edge of this growing center unit. Getting closer. Attach block number four to the left edge of the unit. Almost there. We are back where we started and just need to join the first goose by completing the partial seam we started with. Press carefully, the seams should all rotate and face toward the center of the square. This sampler block should be 6.5 inches unfinished. 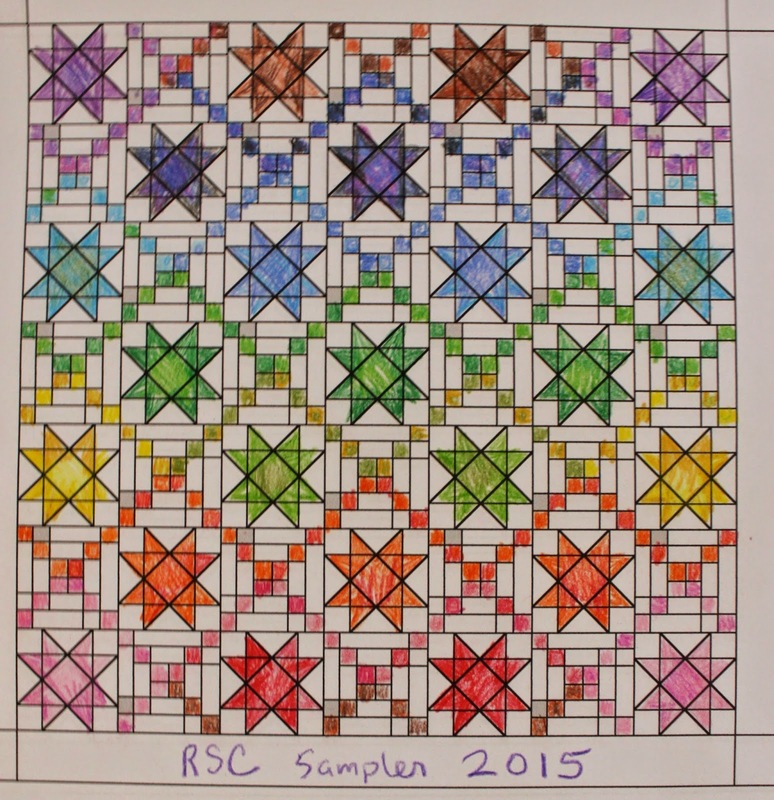 Follow the Sawtooth Star directions to add the star points around your sampler square. It should be 12.5 inches unfinished. There is a tutorial for the Sawtooth Star points here. Not to forget the Pinterest Page of finished blocks as they come out.